The first Pay-Per-View event of 2018 is just around the corner and it may just be headlined by the greatest heavyweight title fight in UFC history. Reigning champion Stipe Miocic (17-2 MMA, 11-2 UFC) puts his title on the line against Francis Ngannou (11-1 MMA, 6-0 UFC) in a hugely anticipated contest. In the co-main event, light-heavyweight champion Daniel Cormier (19-1 MMA, 8-1 UFC) takes on the streaking Swiss Volkan Oezdemir (15-1 MMA, 3-0 UFC). Miocic has won his last 5 fights by TKO/KO stoppage, with the last 4 coming in the very first round. 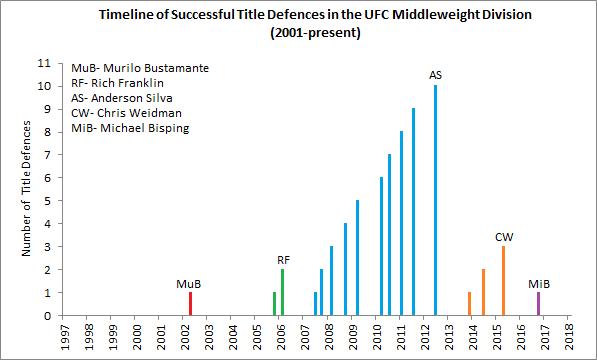 After winning the belt against Fabrício Werdum, Miocic successfully defended against Alistair Overeem then Junior dos Santos, all 3 bouts lasting a combined 9 minutes and 36 seconds. 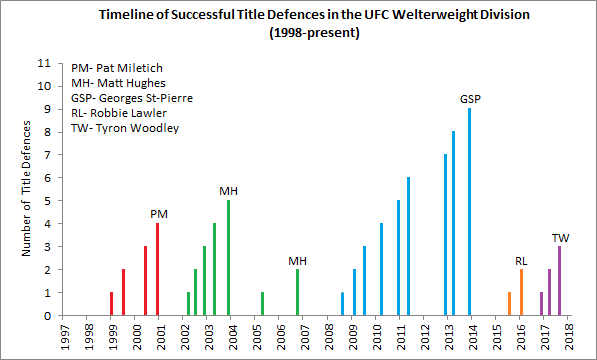 If Miocic is victorious on Saturday, he will become the first man to successfully defend the UFC heavyweight title more than twice consecutively since the belt was first introduced back in 1997. Ngannou, like Miocic, has won his last 5 fights inside the distance, with the last 4 finishes also coming in the very first round. His last 3 fights, against Anthony Hamilton, Andrei Arlovski and Alistair Overeem, lasted a combined 5 minutes and 11 seconds. Ngannou’s emphatic KO victory over Overeem won almost every website’s Knockout of the Year award for 2017. That fight, at UFC 218, came just 49 days before this Saturday’s UFC 220. 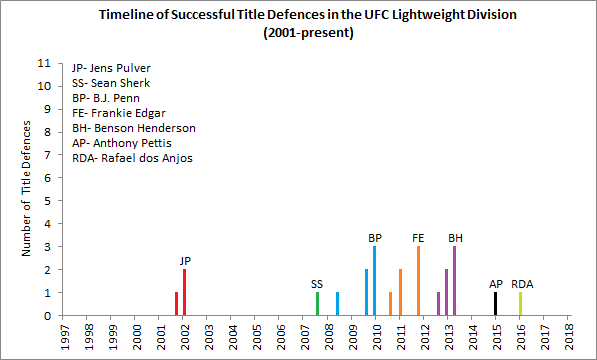 Here’s a look at how these two fighters fared when competing against common opponents shared throughout their careers. 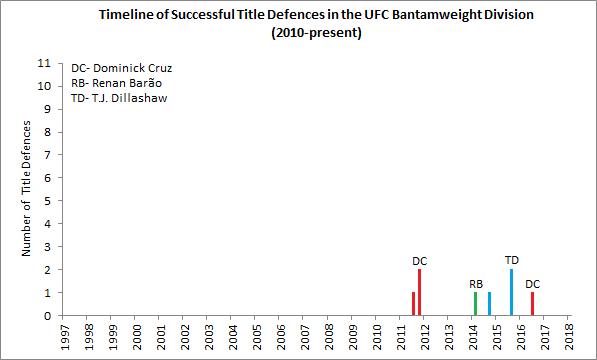 On the left of the graphic, you’ll see how Miocic fared against any shared opponents and on the right, you’ll see Ngannou’s results against the same men. 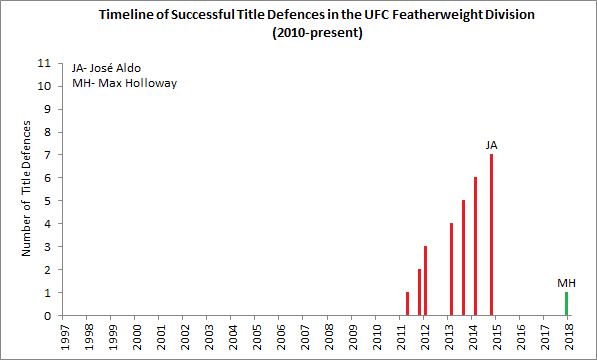 The two men have faced two common opponents; Andrei Arlovski and Alistair Overeem- and recorded almost identical results. Both men defeated Arlovski via first-round TKO, before scoring a first-round KO victory over Overeem later in the same year. Cormier followed a dominant decision victory over former UFC middleweight champion Anderson Silva (a non-title affair) with a submission win over Anthony ‘Rumble’ Johnson. His last fight, against long-time rival Jon Jones, originally went down as a third-round TKO loss until Jones’ drug test failure saw the result overturned to a No Contest. 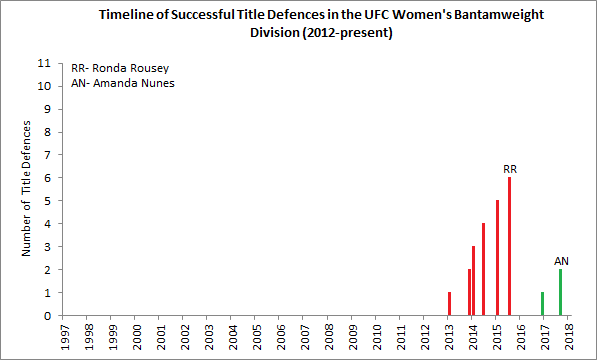 After a few weeks of deliberation, the title was stripped of Jones and Cormier was reinstated as champion. Oezdemir only made his UFC debut in 2017, making his bow in a split-decision victory against Ovince Saint Preux that 14 out of 16 polled media members thought Saint Preux won. Oezdemir’s next two fights were much more conclusive as he scored first-round KO victories over Misha Cirkunov and Jimi Manuwa, those fights lasting 28 seconds and 42 seconds respectively. 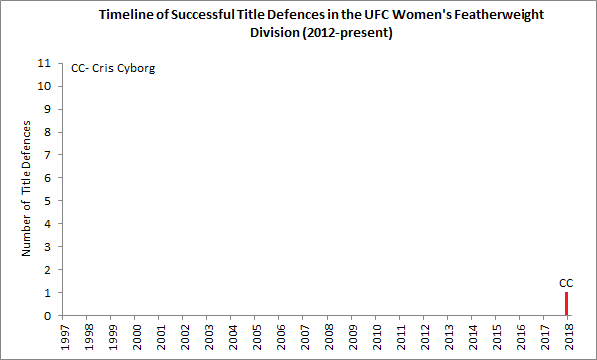 Cormier and Oezdemir share no common opponents throughout their professional MMA careers. UFC 220: Stipe Miocic vs. Francis Ngannou has a decent score of +16. This score ranks joint-12th out of 39 events in the last year and joint-8th out of 13 Pay-Per-View events in that same time frame. As you can see, this score exceeds the +11.1 average for all events in the last 12 months, though it does fall short of the +24.3 average for Pay-Per-View events in the same period. The highest individual contributor to this score is Francis Ngannou (+6), ahead of Stipe Miocic (+5), Volkan Oezdemir and Shane Burgos (both +3). The lowest scorers on the card are Gian Villante, Sabah Homasi and Gleison Tibau (all -2), whilst four fighters are making their promotional debuts this weekend. 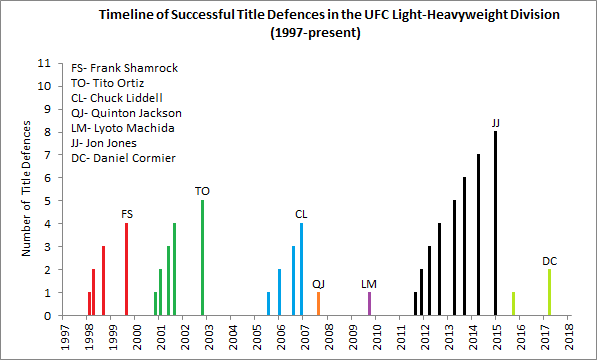 Beneath is an annotated timeline that displays successful title defenses in the UFC heavyweight division between 1997 and today. 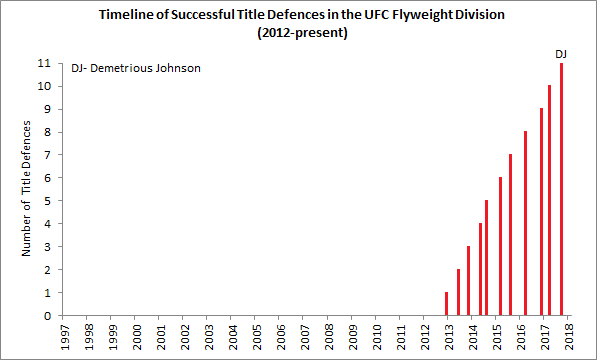 Can Miocic become the first heavyweight in UFC history to record three consecutive title defenses, or will Ngannou continue the cycle? 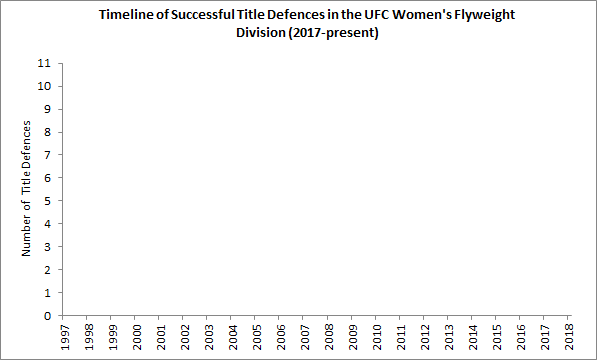 Similar annotated timelines for each division can be found here: Light-Heavyweight, Middleweight, Welterweight, Lightweight, Featherweight, Bantamweight, Flyweight, Women’s Featherweight, Women’s Bantamweight, Women’s Flyweight & Women’s Strawweight.